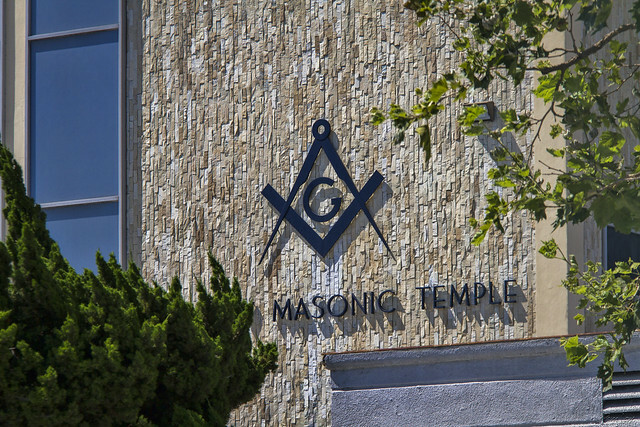 Masons have been meeting in Downey since 1871. The current Masonic Temple is located in downtown Downey on Downey Avenue near Third Street. But that's not exactly where they started. The first meeting was held in 1871 in the Mercantile House of Frank E. Adams, on the southwest corner of Santa Gertrudes and College Avenue, now Paramount Boulevard and Alameda Street. Since the area was primarily an agricultural community with Downey as the shopping center, the meetings were held on the Saturday of or next preceding the full moon. This allowed the members who came to town by horse and buggy to do the shopping, stay for the meeting, and return home by the light of the moon. In 1874, the Lodge moved to a building on the east side of Crawford Street (Downey Avenue), between First Street (Firestone Boulevard) and Second Street. In 1965, a new three-story Masonic Temple was built nearby, and the old building was torn down. In 1883, the Lodge purchased a site for a Masonic Cemetery. The cemetery remained under the control of the Lodge until 1925, when it was deeded to the County of Los Angeles and became what we know as the Downey Cemetery.